​This is a great children’s Multi-Vitamin & Mineral Formula. Cherry, Strawberry, Lemon, Orange and Grape Flavored Bear Shape Gummies in Dark Red, Light Red, Yellow, Orange and Clear. 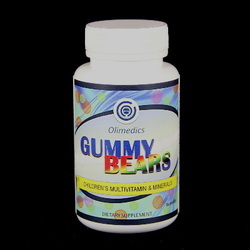 Take 2 gummies daily as a dietary supplement, or as directed by a health care professional. Do not exceed 3 gummys daily. Gluten-Free. CONTAINS TREE NUTS (COCONUT OIL). This product is manufactured and packaged in a facility which may also process milk, soy, wheat, egg, peanuts, tree nuts, fish and crustacean shellfish. KEEP OUT OF THE REACH OF CHILDREN.DO NOT USE IF SAFETY SEAL IS DAMAGED OR MISSING.STORE IN A COOL, DRY PLACE. Active ingredients: Vitamin A, Vitamin C, Vitamin D, Vitamin E, Vitamin B-6, Folic Acid, Vitamin B-12 (cyanocobalamin), Biotin, Pantothenic Acid, Iodine, Zinc, Choline, and Inositol. Other ingredients: Glucose syrup, sugar, dextrose, water, corn starch modified, gelatin (bovine), malic acid, sodium citrate, natural flavors, natural colors (Annatto, turmeric, elderberry juice & grape juice concentrate), coconut oil and carnauba wax.